Arne Hendriks is a Dutch artist and researcher, best known for The Incredible Shrinking Man, a critical research project that asks people to consider scaling down to fifty centimeters (about 20 inches) in order to use the planet’s resources in a more sustainable way. Rab Messina, born in the Dominican Republic but based in the Netherlands, is a design journalist. 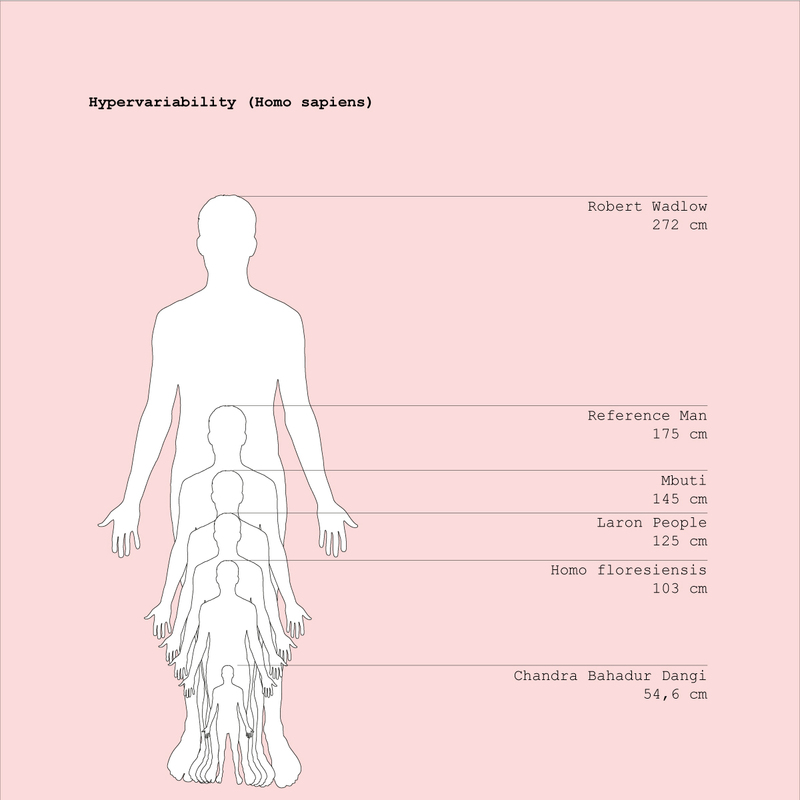 She is working on a research project that examines the role of socioeconomic guilt in speculative biodesign proposals that use the human body as a site or a source of material. As the modern world has been made for the male, the large, and the western, the fact that Arne is 195 centimeters tall and European, while Rab is 160 centimeters and from the global south, offers a stark representation of their positions on either end of the power spectrum. The middle ground between them is their common vision of the role that biodesign can have in creating a more equal playing field. But the conversation between the two isn’t about the redesign of the body itself, rather it’s about the mental switch that happens right before we think of engaging in a redesign. Rab Messina: My research started in a weird place. I hadn’t been back home to Latin America for a year and it struck me how easily I had forgotten about inequity. I forgot you have to live in a country that faces it every day in order to truly understand it. I had been in Santo Domingo for only three days when I realized that my research wasn’t just about biodesign, but it was about guilt. It’s western guilt related to the Anthropocene—the Age of the human. No matter what designers do, they can’t seem to beat the cycle. Take, for example, the electric cars you have here in the Netherlands, sold as a positive alternative… and yet, the cobalt needed for those rechargeable batteries is still linked to exploitation in the DRC [Democratic Republic of the Congo]. In "How to Sit on a Chilean Volcano" (TL Magazine, May 23, 2018). Rab Messina writes about “Manufactured Landscapes”, the exhibition at the Friedman Benda gallery, where one person's trash becomes another's source material for furniture design. 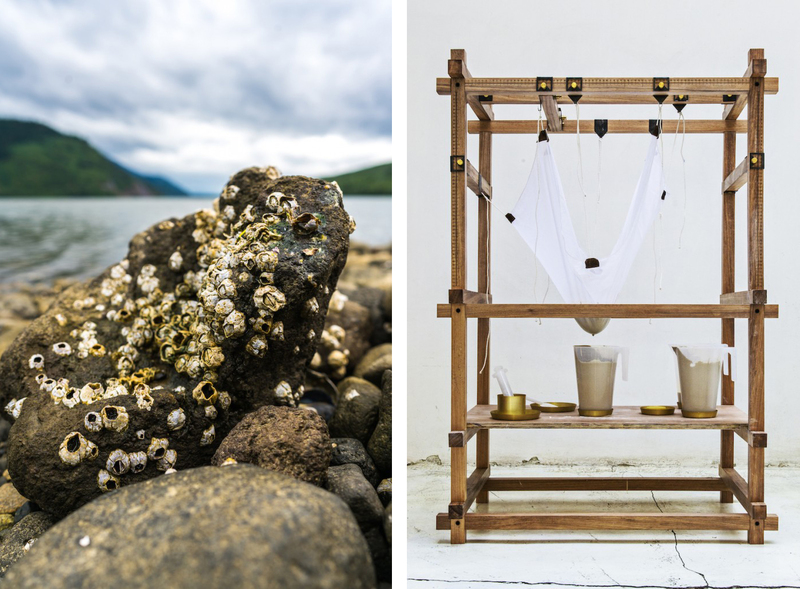 Shown here is volcanic rock and casting process work by Chilean designers, gt2P. Credit: gt2P. So, no matter what you do as a western designer, you still carry the burden of not being able to do enough to unlink our vicious human-centered cycles. And for some reason I kept thinking about anorexia, about how you turn to controlling your body when you can’t control the external variables in your life. The speculative projects I studied weren’t about transhumanism, where technology is used to provide an advantage to an already privileged body. Instead, these projects, coming mostly from western Europe, ranged from shoes made from sweat, to a lamp that lights up not with electricity, but with human blood: they were about taking vital matter and somehow giving it to the world. In your case, with The Incredible Shrinking Man project, it’s about handing over a very visible representation of advantage, which is height. That idea was shocking to me. At first, I laughed, because in dating apps, the first thing straight men lie about is their height, in order to appear taller and thus more attractive to women. Or take the business world: the average height of a Fortune 500 CEO is 188 centimeters [over six feet]. It’s a great advantage in terms of how men are perceived as superior by others. Arne Hendriks: Of course. In the beginning, I didn’t know how interesting—also for myself—size would become as a topic. You cannot always see all the implications of body size; that in the end it connects to basically everything: to all the evolutionary principles, to economy, to philosophy, to how we feel about ourselves… maybe to issues of privilege and guilt. I didn't know the research was going to take so many years. Rab: When did your Incredible Shrinking Man project start? Arne: Maybe in 2006 or 2007. I just made a note on a piece of paper: I asked myself what life would be like if people were only twenty-five centimeters [about 10 inches] tall. Not in a fairytale way, but I was more interested in perception. It was this idea that you can shrink into a new reality or towards a new reality. Then I started to investigate how people of different sizes see what they see, how they describe it… but I didn't really get to answer that question because immediately, through every aspect of people's size, I fell into such a rich information sphere that I never got out. And I'm still in it, trying to make sense of the ramifications of body size on how we perceive ourselves, what we feel entitled to, how it represents us as beings. Being tall myself, I've always been sensitive to issues of size. I was always the tallest guy in my class. I didn't want to be, obviously. I wanted to be average, I guess, at that time. I've always felt my tall body’s presence. That's how it started. 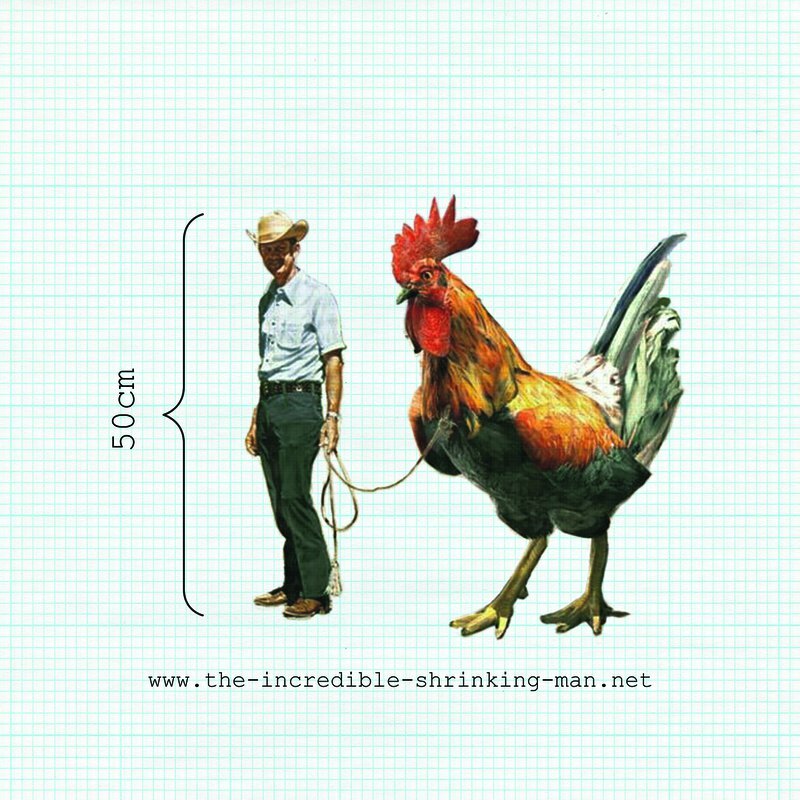 Concept image from Arne Hendrik’s The Incredible Shrinking Man project, 2011. Credit: Arne Hendriks and Jasper Van Den Berg. Rab: How have the responses evolved? Arne: I hope one of the strengths of the concept is that since we all have a body, and we all have an opinion of our body that is both informed through ourselves as well as others, that it allows people to connect their individual reality with the greater narratives of our times and find a place within them. The people who seriously follow the project are probably interested in how issues of size and shrinkage relate to their own interests, and they are perhaps also able to appreciate the combination of reality and metaphor. Some seem to be integrating this type of awareness or sensitivity into their own language and their own work; we’re having conversations on another level. In any case, I just move forward and repeat, polish, and expand the argument hoping it will one day become impossible to deny. Rab: It's also become much more relevant compared to ten years ago. The awareness of privilege is finding increasingly tangible forms of representation, and this fits right in. Arne: It's not just fiction anymore. Considerations of body size and its implications are being investigated more seriously nowadays, as things that can really be considered. Scientists like J.B.S. Haldane, Geoffrey West, and John Tyler Bonner, and especially the engineer Thomas T. Samaras, whom I consider to be the godfather of shrink thinking, have for a long time been aware of the implications of body size, but mostly in a descriptive way and not as a way forward for the human species.. It’s not presented as a way to intervene. There is a lot of talk of intervention in biotech and obviously we are already doing so, but it’s not yet really connected to general human size, I feel, unless it's the abnormal, like oestrogen therapy in the fifties in the States, for instance. Samaras is one of the exceptions. He’s been warning the world of the ramifications of body size for forty years now but not so much as a manifestation of inequality. He’s opening up the possibility to actually want this because there are so many advantages to it, from health to environment. People use the power of the metaphor to look at all sorts of things in their lives, but I'm always trying to make sure it doesn't just become a metaphor. There's also a realistic aspect to it. I guess it’s funny that an artist is trying to overcome the metaphor. If you consider the incredible diversity in evolutionary strategies from the perspective of wanting to become smaller, it is immediately clear that many of those stories are not told. We haven’t been educated to see the beauty and power in the notion of small, rather the opposite. It’s all competition and dominance. But I want to believe this is rapidly changing. In regards to privilege, let’s just say that if we find it within ourselves to desire being smaller we may also have come a lot closer to letting go of some of the privileges that are manifest in height. Rab: With your work, you’re questioning whether growth is actually better. The other day we were talking about Downsizing, the 2017 Alexander Payne film, which also points to that imaginary becoming much more present. The takeaway of the movie is that it's human nature to always want more, so you’re willing to become less because then you’ll have more. Have you thought about which patterns we might replicate even if we shrink, even if we fix certain environmental issues? Arne: This is, I would say, one of the great paradoxes and perhaps greatest challenges in the project. Can we embrace the idea of smaller, of less, if we only do so to have more? Is it not just another step towards an even more omnipotent presence of wanting it all? And will this in the end truly create a new perspective on life? One of the issues with size is, of course, that the small needs much less. Because of the laws of proportion, a person that is ten percent smaller weighs almost one third less. The marine iguanas on the Galapagos Islands are able to shrink their body size up to twenty percent, including their bones, in times of scarcity. In fact, quite a few animals are able to do it. It’s called the Dehnel phenomenon. And then there’s the fact that animals have started to shrink already, to offset their higher caloric needs because of our warming climate. Dwarfing is one of evolutions most interesting ‘experiments’ and people are starting to pay attention. 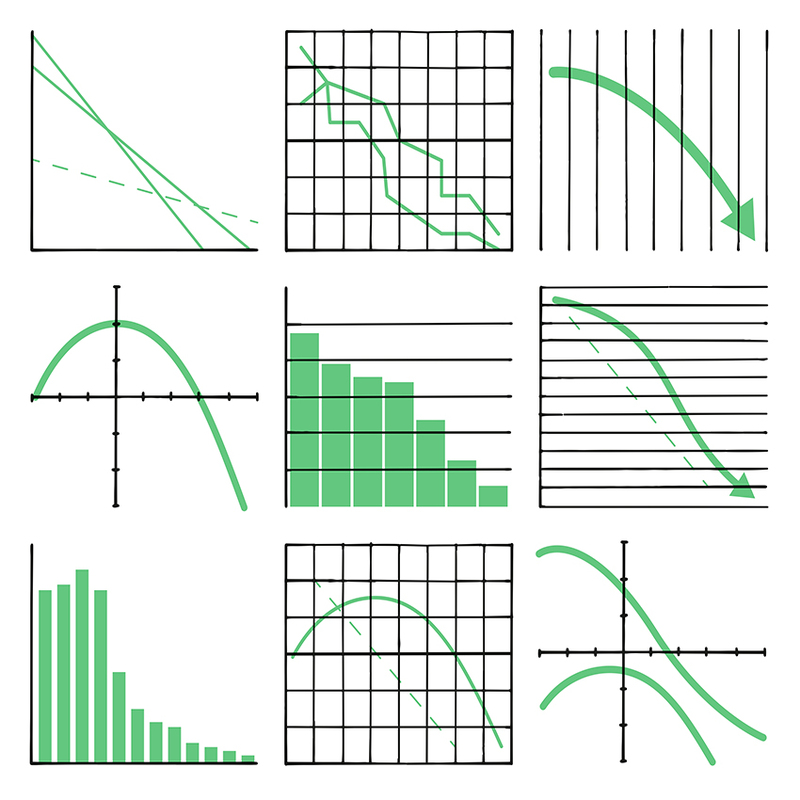 Shrinking in order to live in a situation of relative abundance is one of the evolutionary principles. Rather than say: “Yes, but we'll start to make the same mistakes when we're smaller,” I have used the ideas as a kickstarter to buy some time and have people think about this rather than just laugh about it. I thought that maybe if you want things to change, you should embrace this evolutionary principle. This idea of shrinking to abundance, being a millionaire with very little money… If that becomes the incentive, somehow the switch needs to be made, right? It's not about becoming twelve or thirteen centimeters like in Downsizing, or fifty centimeters like in my theoretical proposal… it's about the first centimeter, basically. It’s about the mind switch. The paradox is that perhaps this centimeter smaller is as greedy as the centimeter that made us taller. The promise of abundance is part of everything in human culture, right? It is central to our religious texts, and perhaps there’s also an interesting relation to guilt. In the story of the grapes of Canaan, where Moses sends the strong men away, they come with these huge grapes, basically a sign of the wealth they will have but also a sign of a lot of trouble to come. Height hypervariability of Homo sapiens, 2017. Credit: Arne Hendriks and Jasper van den Berg. Rab: One of the key topics in my research is the present-day effect of colonialism. As a kid growing up in Latin America, I knew that western European people were taller because they were healthier. When you come from a country where most people don’t know where their next meal is coming from and your height suffers as a consequence of that, the hope that your children might be taller than you is a promise of abundance in itself. The average male height in the former Dutch colony of Indonesia is, for instance, 158 centimeters [62 inches]. Since the Golden Age, the Dutch haven’t been standing on the shoulders of giants, but on the shoulders of shorter people and the resource squeeze their height represents. Have you explored the issue of colonization in your work? Arne: It comes in but I haven’t addressed it directly yet, in part because I’ve tried to steer the desire around height towards the qualities of being small, rather than have small get caught up in stories that perpetuate the negative connotations it has for so many. At the same time your question also opens up why perhaps I should change my approach. I wonder for instance how much of the health story is just that, a story, put forward and perpetuated as part of colonialist propaganda to also create a feeling of being less (healthy) in the colonised. How was height considered in Latin America before the occupation? How much of the height difference was resource squeeze? Colonialism created, and certainly expanded an evolutionary height development where some started to grow too tall, and other perhaps not tall enough. How can we reframe the outcomes of this development to learn how to become smaller? Again these are not questions I have answers to. The Incredible Shrinking Man allows me to respond to height as a sign of quality, and try to find the quality in even the most unlikely places. Perhaps colonialism will direct us to such places as well. The current relationship between height and health is that taller people in similar circumstances die younger. Every centimeter takes a few months of your life. Thomas Samaras has collected hundreds of research papers about this relationship. Smallness is the body trying to overcome hardship. Although the hardship is something negative obviously, we should dismiss the cause and effect confusion. Smallness is actually something positive, something amazing, it allows us to survive. It is a sign of strength and resilience. For me, this story of dominance is more evolutionary, in a sense, than it is cultural. Of course, it’s been reinforced by culture: in psychology, there’s this default yielding response that people have to the tallest person in the room. They project an expectation of that person being more gifted, a better leader, stronger. These patterns have been reinforced consciously, but many times also subconsciously, and this has a relation to the idea of colonialism, and how taller people became a kind of ideal. To you, the tall body represents health and power and other things that you do not have; to people in the global north, it represents what they want to hold on to and defend. But today, it has become a responsibility to start deconstructing those stories, because if we continue to tell them in the same way we’ve told them over the last one hundred years, we will always have this ideal projected on height. We need to somehow make a break with the attitude and the language. I see myself, basically, as a greenhouse plant: I grew up very tall in the greenhouse because of the perfect circumstances, but if you take me out of the greenhouse maybe I don’t stand so tall anymore. Rather than look back on what’s been told, we need to look at words like “better” or “healthy.” Even if it’s artificial, try to embrace this idea of becoming smaller, and then, a lot of things won’t make sense in the use of language in relation to height. Even if it may be right in some ways, I use another paradigm to counter the paradigm of height and dominance. It’s not perfect, but I hope it’s a start. Rab: If I take into account what you just said, I have to say I'm not used to having this type of advantage over other people. Arne: How can you have an advantage if you've never understood that you can have an advantage? Rab: It's just not ingrained. Subconsciously, it’s just not there. So even on my side, there's a mindset change… maybe as difficult or even more difficult than yours. Arne: At least as difficult, yes… but maybe even more difficult because of the power relations. That’s the challenge: managing to defeat the default yielding impulse to taller people. If the concept has never been that small size is better than tall size, then you cannot see it. It’s not that you don't want to see it, but you are blind to it in every action that follows from not being able to see it. That’s how culture functions, how politics functions, how the economy functions, how maybe the bodily relationship between the north and the south functions. I always make these small mistakes in the way I talk, but I’m aware and I’m sensitive to it. That’s hopefully already one step. Rab: Have you thought of another word for small? Arne: I like the word small. Rab: That's because I'm 160 centimeters tall. Arne: But I think that's part of the ingraining. If you go to a Starbucks and you want a small coffee, you cannot find it. The smallest coffee is called a tall. What happens is that the idea of small just disappears. Can you imagine if you just sort of radically moved from Starbucks to society? Then, small would not exist anymore, as a result of our brainwashing that bigger is better. It’s not. All it does is make us into better consumers of the idea of big. Small cannot remain invisible. Rab: So, Howard Schultz figured out the promise of abundance pretty quickly in the game. Arne: Yeah. Small became a way out of a depressing life. In that way it is pretty accurate. Unfortunately in the film it is also a way to continue a bankrupt mode of living based on growth. Rab: Pop culture is, as you mention, also part of how we subconsciously acquire thinking, and I was watching Miracle in Milan  the other day. The main character, living in the slum, gets a magical pigeon and he starts granting wishes to people. This lonely man wishes for the statue of a ballerina to come alive so that he can be with her; other people want fancy clothes, so they can be respected. They’re indirectly asking for important emotions, like love and admiration. Well, this one man says: “I want to be taller.” But here’s the funny thing: he immediately thinks the pigeon made him too tall, so he asks to be made a bit smaller. That’s the early fifties in Italy, and there seemed to be this underlying idea of the Goldilocks principle even in a country that had been affected by war and wanted nothing but growth. But in many other pop culture examples, smallness equals punishment. There’s Alice in Wonderland  and the film that inspired the name of your project. I can think of one positive iteration, in Almodóvar’s Talk to Her . Have you thought of the word punishment, as well, within this context? Arne: First, let me think if I agree that's true. If you go to the movie The Incredible Shrinking Man , the director, Jack Arnold, added a final sequence that wasn’t in the book: he comes to some sort of beautiful philosophical embrace of the fact that he becomes smaller, and he connects it to the universe. He says something like: “I was continuing to shrink, to become what? Infinitesimal. What was I? Still a human being or was I the man of the future?” That is presuming that something new is happening and that he is progressing to another thing, so there is not just negativity in that. The whole film is a drama and he needs to fight for existence, but the outcome of the drama is something, you could say, almost magical, because he embraces the idea that he will shrink towards the molecular, which obviously is not possible—but that's not the point. It is the idea behind it, the value that is given to becoming smaller. It’s basically being part of everything again. In Alice in Wonderland, this shape-shifting between big and small… yes, she is afraid, she is confused but also, she somehow realizes that by becoming smaller she comes closer, and then by growing again, she sort of becomes disconnected. But that's also probably because I read it in a completely different way. For you, it probably connects to your experience: feeling small. For me, it connects to my desire to embrace small as the best quality that you can have. The relationship between you and me is interesting, because we’re trying to build a bridge of language. I'm trying to understand how powerful the relationship is that you have with the idea of small and tall, and how I can accommodate an opening to where it's another experience of that, and where you can feed from me, because I'm pretty aware of my sort of alpha-male dominant presence. Rab: Regarding that dominant presence, as much as there’s the evolutionary story that taller men can protect women, there’s also the very clear opposite, where they can overpower and hurt us. In this scenario you’re proposing, would women also be as tall as men? Arne: In my mind they are, yeah. I often talk about the fact that most women are attracted to tall man and how it would be great if this changed. Even thinking about how to achieve that already brings the complexity of our species into focus. Perhaps it would also make height more equal since male height nowadays seems to be the result of some sort of Fisherian runaway principle where the genes for tall man are spread around, as well as the desire for tall man in women. Rab: What are the implications of that height equality? Arne: I've never explored it that much, but it's one of the great outcomes, I would say. I'm very aware of the difference between men and women in size, because I'm very aware of human size. I think your questions are extremely interesting because they imply the political side. It becomes a part of other struggles that we need to engage with as a species. Some of those I've kept on an abstract level, not because I won't go there, but because I have to be careful not to become too directive, because I think that the challenge of embracing the idea of smaller in itself is already so difficult that I have not yet even come to the point where we can find these important nuances. People are not ready to engage these topics from the perspective of small as a quality and therefore small in these discussions will end up the victim again, as a concept. But to answer your question, if men and women were the same height I would hope this would create equality in other aspects as well. Rab: Initially, when I started reading about your project, it reminded me of veganism. The people who choose to become vegan are usually those who can afford to not eat protein in the first place. Have you presented it anywhere in the global south? Arne: Only some lectures on it in Kenya and in Tanzania, and recently in Brazil. Rab: What was it like in Brazil? Arne: Well it was in São Paulo, which I don't know if that's Brazil-Brazil. Rab: It's a whole other universe, even within the country. Arne: Brazil is the future for me. It was more about what it meant for me to be able to talk about these things there than maybe it was about them. It was received very enthusiastically but being there I really saw the future of the human species, because it's just so incredibly diverse. My wife, for instance, has a mixed background, so I'm already looking for that future; my children, obviously, also. I'm trying to find that future somehow in the present. And in Brazil, it was there. In relation to size, they have the same dominant idea of wanting to become taller. It's very much still part of the mindset. There are some really hard paybacks when you are that tall, so we talked about life expectancy and the loss of proportion being such a burden not just on yourself, but for the planet in general. If there were nothing to pay for this larger body, then I think it would be even more difficult to make people take even a minute to consider it. Graphic exercise for shrink thinking from The Incredible Shrinking Man project, 2018. Credit: Arne Hendriks and Jeroen van Kempen. Rab: These projects are not very common in my part of the world. We don't have the funding system for it. In Ancient Greece, the time needed to engage in philosophy was financed by slavery. In this logistical sense, how did they receive a project such as this one? With any sort of research project, my very Latin American way of reacting is: Does it make money? Arne: People sometimes ask me how I make my money. I think one person there asked me: “So, how do you do that?" But that happens all over the world. It's an interesting reflection on your part, and I'm just grateful that we can have these ideas. What can I say about that? Rab: It's not just necessarily the funding. It's a gift, in a way, to realize that these projects can be done. It is the gift of possibility, the permission to think beyond what is directly available to me, beyond the near-future thinking that we are stuck with. And in that sense, this project is a great beauty. Arne: It could be because I'm from here [the Netherlands] and it is perhaps easier for me to allow these thoughts, but I don't think there is such a big difference. People are basically just as stuck, but just in another type of thinking with other rules, and maybe rules where the questions about where next meals come from and having a roof over our heads are not as present. And yet, they are stuck in another very, very powerful system that does not allow them to explore freely what it means to be a human being. How can we bridge the gap if we’re stuck? Your words are just a powerful reminder that there’s a lot to do. Although I look at science for answers to some of the practical questions of wanting to become smaller the project is, of course, about the desire to go somewhere, to be something and to want. It's more about the ideas, because ideas always preclude; they're before the actions, somehow. Our ideas pull us into a possible new reality, and therefore our ideas need to be good, honest, and about changing the obvious wrongs in society. If the desire is ignited because we're inspired, and we want something, then science will follow. Science in that way is not just an avant-garde of possibility: it also follows very much what people want. So, if we would like to become smaller, then we will, for sure. Rab: What is the response from the scientific community to some of the collaterals of this project, the many things involved in the system that are manifested in height? By talking about height and the space we occupy, we’ve come to think of real estate, violence and fear. Arne: I’m not sure how far they allow themselves to think that far along the line and as I said before I also don’t want to get ahead of myself in this. Perhaps because I’m aware that showing all the implications of this simple reversal of desire might kill the possibility of it becoming a reality. At the same time over the last two or so years I’m entering into relationships with disciplines of science that show this is not just about shrinking the body. I was an artist in residence at a cancer research facility, the Hubrecht Institute. I'm exploring the link between cancer and the economy, and the presumption is just that this four-and-a-half-billion-year-old system, the cell, knows something about growth, and where growth becomes malignant. That process is a metaphor for this obsession with (economic) growth but also I’m curious to find if we can take a standard text on cancer like The Hallmarks of Cancer, and analyse its principles from an economic perspective. Most scientists at the institute are very aware of the broader principles of growth and what cancer might teach us in this regard. Many scientists are just waiting for society or for a project like this to open up a space, so they can start expressing what they found in the exact field in a more, let’s say, communicative way. We’re writing an economic theory based on the work of cancer researchers, which will continue over the next years. Rab: With cancer research it's quite specific, but do you see another role to the creative part of the equation beyond communication and creating space? Can the creative side come up with ideas that the scientific side has not yet? Arne: If anything, I feel many in the scientific community want us to ask other questions, create other ideas and desires within society to follow, because they’re people. At the same time, I’m not sure how big these question can be. Can we change the paradigm of continuous growth? Can we find a new direction for humanity on this planet? Can we find alternative value system that are not about competition and extraction? Science is often so married to the powers that are in place that it is impossible to make a change from within. So, the biggest change has to come from outside of science. We, the people, have to ask them other questions. The creative community is an important part of this process because we specialise in disrupting the known. Even the known that has become almost invisible, like the power structures beneath the science, and what it looks at and doesn’t look at. Just because science has become blinded by deeply embedded ideas about what it is they need to do. At the same time, it's probably important to keep a sort of autonomous parallel space, where we jump into each other's areas, but we don't become responsible for each other's direction. 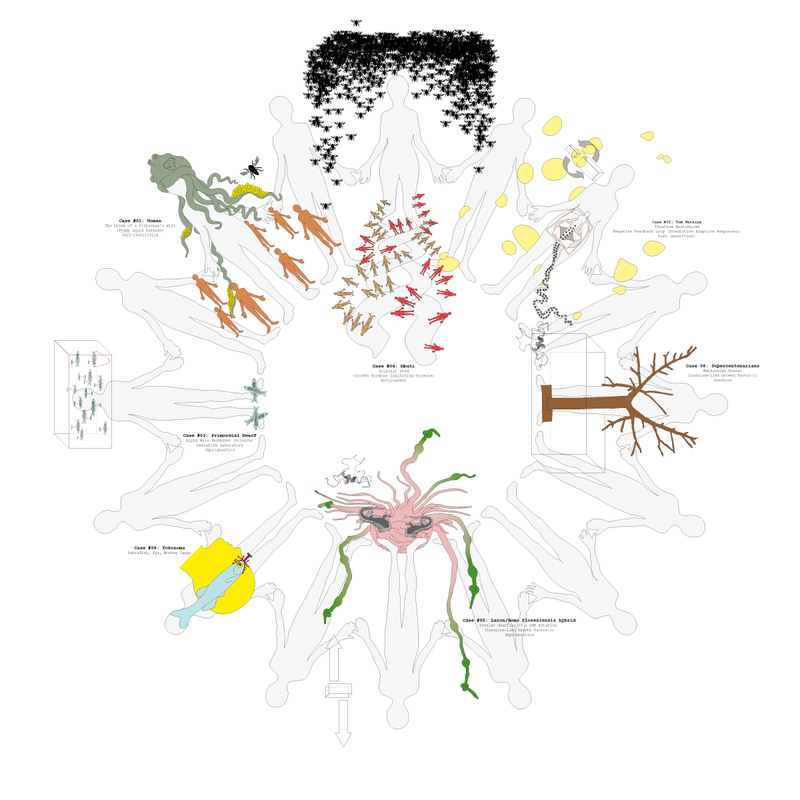 Scientists will not create the same spaces around their fields as artists or biodesigners will, yet together with other disciplines, we can change direction. Rab: I keep thinking that 2017 and 2018 have been years of reckoning, not just with women and people of colour, but with anything that might point towards positive inequity or casual advantage. Arne: I hope you're right. I really hope you're right, and let's suppose you say that you experience this reckoning as a sign that it is true, because you make it true. I think this sort of thinking needs to happen a lot. I guess in a way, for me, the size matter relates to these matters. It's the emancipation, it's also letting go of presumptions, trying to not be a prisoner of the ideas that have been put into you. Rab: Did you ever struggle with the white savior complex? Arne: Yes, but I don’t know how to resolve that, apart from reminding myself and trying to be aware. It’s hard to do, but maybe you can tell me: How do you do that? How do you just do what you intuitively attempt to do from joy and interest and curiosity and awareness? For a long time, into my thirties, I engaged in an intellectual questioning of myself, without acting. Perhaps that was in some ways the best way to make space. One tall white man with a big mouth less. But the world becomes so chaotic and impenetrable when you’re not a part of it. It’s just a wall of impossibility, and for me, stepping into it and speaking out about something I find important now means that at least I’ve taken a position. I can be confronted. I’m trying not to hide. Rab: I want to go back to the concept of guilt, though, because you used the word average. You said you wanted to be average when you were younger. What is average? I was watching the new season of the American sitcom Unbreakable Kimmy Schmidt, and one of the bits has a Korean manicurist telling a white woman who’s trying to defend her from work abuse: “Yes, the important thing is that you feel better.” It makes me wonder how the other side feels. Arne: Of course! It's like I'm the worst person in that way to do this project, but also the most obvious one, because I am that tall. So, it's a paradox, you know? It is difficult. I try to address this paradox in my work by trying to think ahead to where it's just people, where we’re all Brazilians because for me, like I said, these are Anthropocentric notions. When I'm very honest, I think I live a little bit further in the future, where maybe these things are resolved, and we are talking about our relationship with the planet. I wish we were already there somehow, that we can get beyond this historical farce of how we are relating to each other, with this north and south divide. But then, we are still left with the issue of how we’re going to behave as a species on the planet because that is not resolved. I once walked into a McDonald’s that was next to a cosplay convention. It was filled with kids wearing costumes of game and anime characters. To keep their fantasy alive, they have a rule not to engage with people that are not dressed for the occasion. They ignored my big powerful presence and I felt the power of their strategy. I was not there. Do we have to ignore reality in order to create change, or do we eventually end up in McDonalds again? Chthulucentric Mandala from The Incredible Shrinking Man project, 2018. Credit: Arne Hendriks and Jasper van den Berg. Rab: I suspected that with the level of detail in some of the extremeness of your project, I said: "For him, it has already happened." But farce is a word that I use to talk about climate change and the impact it has here in the Netherlands, as these countries are better equipped to deal with global warming and its consequences than those in the developing world. When you go to the supermarket and buy an eco-friendly this or a fair-trade that, it's almost a farce. Because of so-called “climate laundering”, these countries cause most of the impact, but aren’t really going to feel the full consequences. These supermarket actions are a sort of performative goodness. In dystopian scenarios and certain political regimes, there’s always an elite that gets to maintain a more lenient way of living. Arne: Let's say that in my view of the future, those demarcations, nations, differences, don't exist really, not in that way. I'm not saying that they won’t, but I believe that the world cannot continue to be this way. There will be a drastic change and we see these drastic changes already taking place. It is very difficult to imagine, but it's also very difficult to imagine that things will remain the way they are. Maybe I'm mixing futures from 2700 with pasts from 1900. I’m not that precise, because I just let these fantasies come out and sometimes two or three years later they make sense to me. That's also why I work in a public way with my research, because I just do these things. They don't need to be right. They don't need to even be understood by me at that moment. I just want to trust that they can be meaningful somehow, because the intention behind them is always expressed. It’s the embrace of another idea about ourselves, the human species. I do feel, though, that your questions trigger a lot of things in me. I would love to be more aware of what happens within the species. The public character of the research allows me to learn from you and others. Not just facts, but also sensitivities and perspectives on what the research actually is or could be about. Rab: Representation is very powerful. Arne: Absolutely. And maybe there is a timeframe when this representation is necessary, before we get to the next phase where things will have dissolved into a new idea of who we are, hopefully more compatible with our living environment, with our planet. Your life is tougher in this context, in any context, because you are a woman with a different background to me. But we also share something: there’s a shared space. If we spend more time in that shared space, then things will change because the proximity and the sharing of ideas and challenges cuts differences between people, and also because it means we’d spend less time in the space that divides us. Rab: The problem is that privilege tends to be zero-sum, unfortunately. Arne: Yeah, and privilege is the result of ideas. We must not underestimate how many of our seemingly ironclad structures are built on a belief in the way things are. If we continue to chip away at these beliefs eventually something must give. Rab: That is the difficult part. Not just in terms of how the industrialized world can do as an equalizer, but how the global south can raise its voice upwards. You have to become one inch shorter… but the global south has to grow a decibel louder. Arne: In the end things will only get better if the HAVE TO changes to WANT TO. How do we inspire the desire to shrink and share, while not undermining the desire to grow where growth is needed? How do we inspire a human species that will move towards that future? I’ve always believed that if we manage to embrace the idea of shrinking our body that this would be a sign of a mind that has already switched, and that everything else would follow.